Delicious, Easy-to-Make Recipes from Around the World” by Rick Browne. I am really excited since this is my first BBQ Tools & Tech review after be asked to join the family here at BBQ Sauce Reviews by Brian Henderson! I hope you enjoy it. I sat down with my family after receiving the cookbook and decided we should all pick one recipe from the book to make for my review. 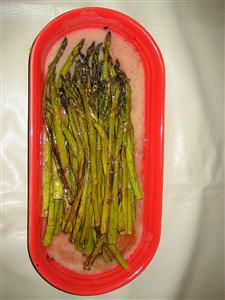 We each took a turn looking through all the great recipes and decided on three to make for our family BBQ that weekend. Like the title states there are over 1,000 recipes to choose from ranging from Appetizers and Meats to Side Dishes and Desserts. 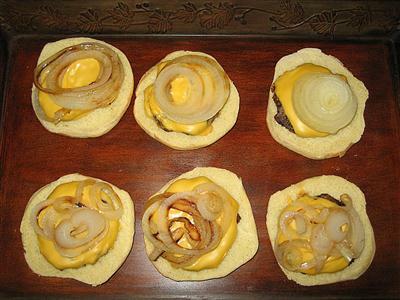 I am a big fan of burgers, so I chose to make a recipe called Wowee Maui Onion Burgers. My mother picked out a side dish recipe called Asparagus with Lemon Marinade and my wife picked a dessert recipe called Grilled Banana Splits. After getting all ingredients together for the burgers and asparagus it was time to fire up the grill to medium high heat between 350-400 degrees. 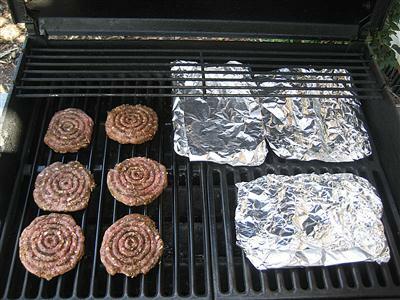 I wrapped the asparagus and sliced sweet onions in foil and put those and the burgers on the grill. After all that was done on the grill we all sat down as a family to eat and chat about the past week. Not one crumb was left on a plate, which always makes my day! Then it was time to grill some dessert. I was really excited to make these Grilled Banana Splits since I have a pretty big sweet tooth. The bananas were cut in half lengthwise leaving the peel on the halves. 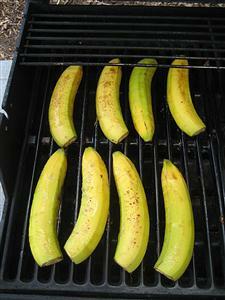 Before putting them cut side down on the grill I brushed them with the cooked butter and brown sugar sauce we had heated on the grill prior to the bananas being added. 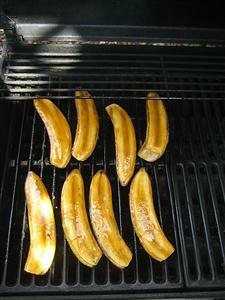 Once the bananas were golden brown and caramelized about 2 minutes I flipped them and brushed more sauce onto them. After being grilled for another 2-3 minutes they were ready to take off the grill. 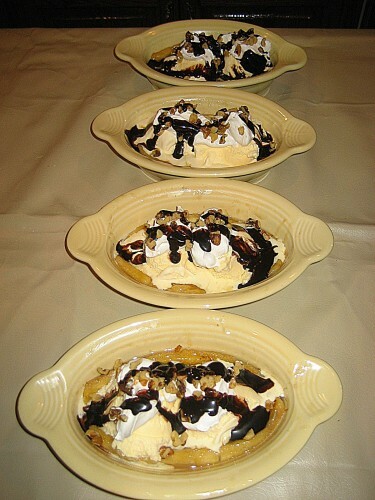 I brought them in the house and placed 2 halves of bananas in each bowl with 2 scoops of vanilla ice cream drizzled in chocolate syrup and topped with whipped cream and chopped nuts. Now it was time to dig into that yummy looking dessert. I was halfway done with mine when our 2 year old started yelling I want DaDa’s. Being the loving father I am, I handed over my dessert and watched as she devoured the rest of it in the blink of an eye. This is one amazing cookbook! I can see myself using this on a weekly basis to try new grilling recipes from around the world! I am sure that will make my family very happy to hear since they say they love my grilling. The great thing about this cookbook is that it has so many different things you can make that it should have something in it that is appealing to everyone in your family. Another thing I liked was being able to get our family together and work as a team to make each of the recipes we had picked out. One thing I would have loved to see added beside the “Yield servings” on each recipe is an estimated cook time. I know being a Stay-at-home Dad I want to have an idea of how long it is going to take to prepare and grill everything ahead of time. That way it helps me when trying to pair different recipes to make for dinner. If you love to grill like I do then check this cookbook out, you won’t be sorry!!! You can find a great deal on this book here. that desert looks really good! 🙂 wow! Troy it was! At least what amount of it I got to eat before our 2 year old wanted mine lol….It really was a great cookbook! Check it out if you get the chance. I am pretty sure you can also find a digital copy of it to read on the Kindle and Nook. I am a Tech guy and love to read books on tablets too! Mmmmmmm…. bananas, brown sugar, ice cream, and chocolate. That should be illegal it’s so good! those Maui’s looked good too – some nice big buns!! lol yeah I think next time I will double the amount of ground beef! Had my mom buy the bigger buns to eat them on 🙂 My wife isn’t a big onion soup mix fan, but she loved them! Excellent review! Lots of good pics in here. Made my mouth water. Thanks a lot Wayne! I really enjoyed doing the review and my stomach did too lol! 2 more weeks till The Jack…Can’t wait man! I been eating only once a day to make room for all the good Q we are going to eat there lol;) Talk to you soon!